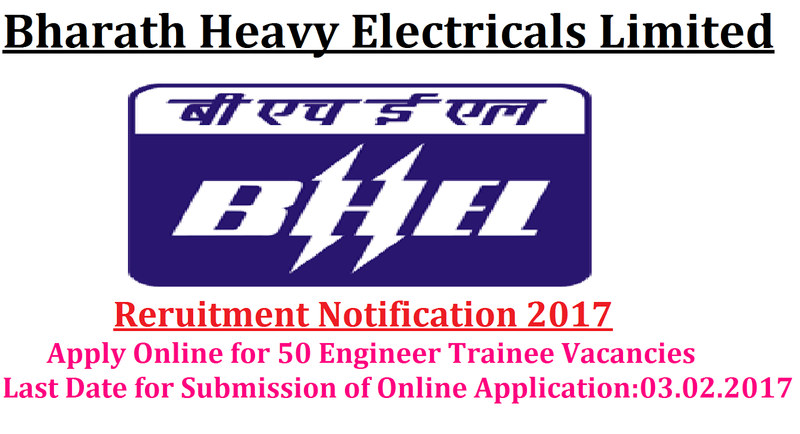 Bharath Heavy Electricals Limited BHEL Recruitment – 50 Engineer Trainee Vacancies – Last Date 03 February 2017| Apply Online for 50 Engineer Trainee Vacancies at http://www.careers.bhel.in from 09.01.2017 to 03.02.2017|BHEL invites application for the post of 50 Engineer Trainee in the disciplines of Mechanical and Electrical Engineering. Apply Online before 03 February 2017. Educational Qualification : Full-Time Bachelor‟s Degree in Engineering /Technology or Five year integrated Master‟s degree or Dual Degree programme in Engineering or Technology in the disciplines of Mechanical orElectricalEngineering from a recognized Indian University/ Institute. Selection Process : Selection will be based on the GATE-2017 Marks and requirement, candidates will be shortlisted for Interview. 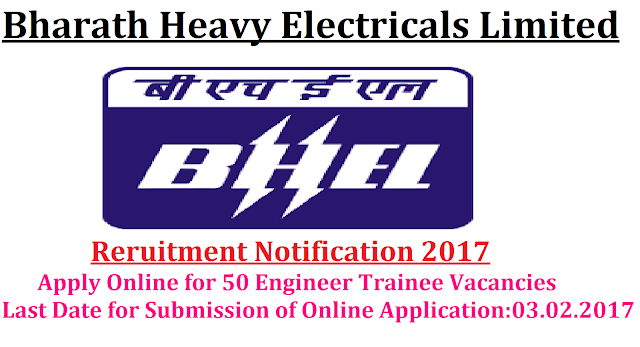 How to Apply : Interested Candidate may apply Online through the Website http://www.careers.bhel.in from 09.01.2017 to 03.02.2017.